Recently I was lucky enough to have a link I submitted to reddit (comment page) make it to the site’s front page. While my link was originally posted to the sub-reddit r/programming, it quickly gained popularity and was on the main page for nearly 24 hours. 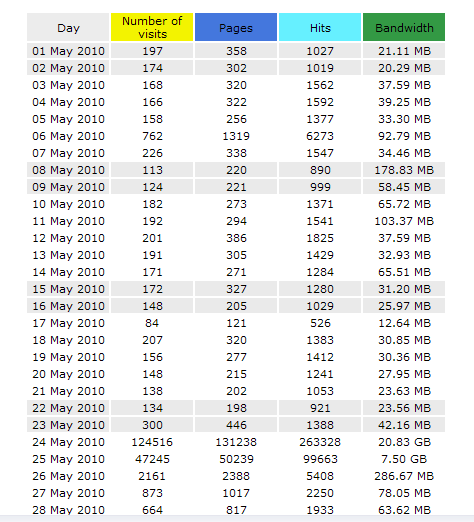 Here’s a look at the raw access log, I’ve included the entire month to show how drastic the increase (and subsequent decrease) in traffic was. The link was submitted on May 24th. The image itself was just over 171 KB, quite a bit of bandwidth was used, fortunately, my host allows 500GB transfer per month. 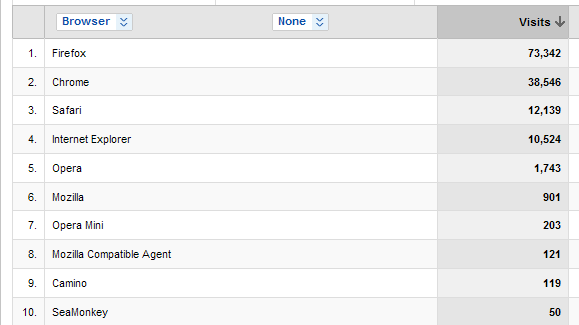 And the corresponding numbers (of the peak day) from Google Analytics which line up very well. No surprise: Firefox is the preferred browser among the tech crowd. 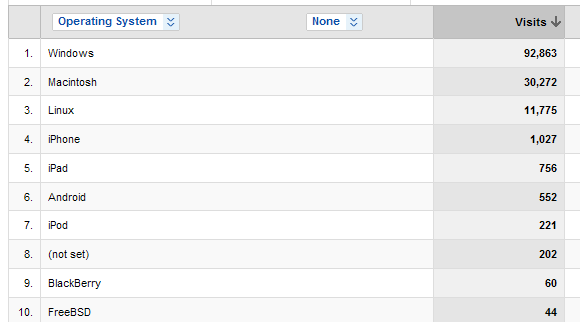 More interesting in my opinion is Chrome beating out IE almost 4 to 1. Those are the numbers that were most interesting to me. Did I leave anything out? Leave me a comment and I will add it if possible, thanks. Let’s face it, finding a respectable job in the IT field is a daunting task, especially when unemployment numbers loom. In these difficult times you need to do everything possible to give yourself a competitive advantage over the next guy. I have compiled the following because I was not able to this information anywhere else. Even though you may not be currently seeking a new employer, you should at least be aware of new opportunities. Please be advised that this is not an article on how to actually created a resume. There are plenty websites dedicated this subject, and give far more extensive detail than I could cover in 1 short post. Typically, your perspective employer’s first impression of ‘you’ is your email address. Think about it, chances are they discovered your resume through one of the online job boards. If you’re anything like me, you’ve removed your phone number from your resume a long time ago because of the incessant calls from headhunters. This means your only available contact information is an email address. The other possibility is that you contacted them, and sent your resume along to their HR department or hiring manager’s email account. My suggestion, get an email address that contains your name. Of course, you’re probably not going to get ‘your.name@gmail.com’, but if you get creative, you can get something close. Try adding a period, your middle initial, or a dash if permitted. Another option is to sign up with a less well known yet reliable provider such as Microsoft’s live.com. The next logical step up is to buy yourself a domain name, and run a mailserver on it. That way you get the full effect, and you aren’t limited by someone else’s business rules. If so inclined, you could have ‘me@mysweetdomain.com’, or anything else that suits you. Again you may need to get creative in order to find a domain with your name in it, you may have better luck with .net or .org sites. If you’re not ready to become a webmaster just yet, name. can get you pretty close. If you’re really serious about standing out, what better way to inform your perspective employer of your skills than to show them what you’re capable of doing? This blog is a perfect example of that. Granted, the framework and template are already in place, but I have modified, tweaked, and otherwise adjusted it to suit my needs. As a programmer 85% percent of my daily work is spent modifying, rewriting, or doing something similar to existing code – so the 2 skillsets (HR speak) mesh nicely. The other great thing about having your own online webspace is that you can have an electronic copy of your resume available at all time! Pro Tip: Create your resume in word (or use one you already have) and save it as a .doc, then upload it to Google Docs. Once you have it up there, view it as html. You can then view the source code and with some minor edits, you can paste it in into an html page on your site. Boom – instant eDocument easily accessed from anywhere in the world. You could also add a link to you .doc for a download. Hopefully you have found something useful here. If so please leave a comment. Also tell me about anything I left out. 2) Have your domain name support itself financially. 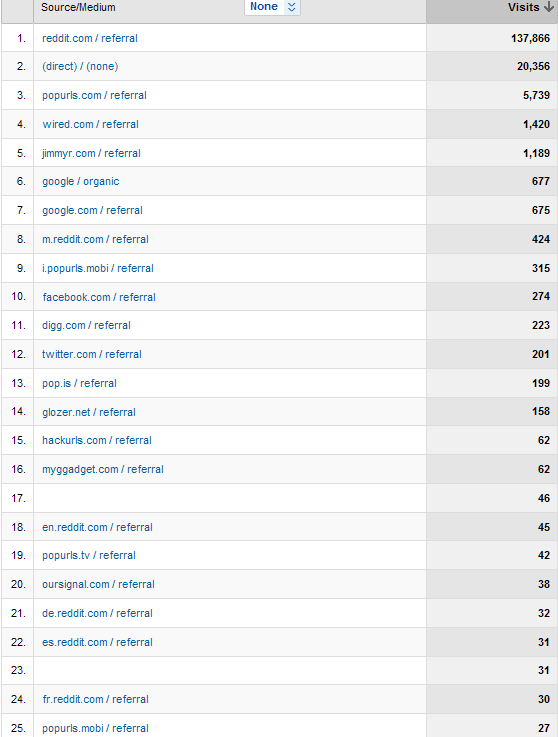 3) Get a post on the front page of digg or reddit.